Mexico is the greatest producer of avocados that are available worldwide. It exports more than 1 million tons of avocados each year. Avocado is a fruit, which is botanically a large berry containing a single seed. Hass is the most popular and the most consumed type of avocado. It is native to South Central Mexico. Avocado is climacteric fruit, which means that it matures on the tree but ripens after falling to the ground. Avocado is often harvested green, so that it can ripen on the way to its final destinations (supermarkets around the world). Avocado becomes fully ripe after one or two weeks. They are commercially valuable and are cultivated in tropical and Mediterranean climates throughout the world. Avocado tree contains both male and female flowers but they mature at different time to prevent self-pollination. This phenomenon is called "dichogamy". Because of that, avocado requires a "company" of another avocado tree to ensure successful reproduction. There are over 500 varieties of avocados in the world. Avocado can be propagated from the seeds, grafts and tissue cultures. Production of fruits starts four to six years after planting. While they vary in fruit size, texture and maturity rate, these types of trees all reach an average height of between 9 and 12 meters (30 and 40 feet), though they can grow up to 25 meters (80 feet) tall. Dwarf varieties, such as the Wurtz avocado, reach an average height of (3 meters) 10 feet. Avocado tree can survive over 100 years under appropriate climate conditions. Almost 50% of Americans consume avocado regularly. California produces 95% of all commercially available avocados in the United States. They have a very long lifespan with some trees in Mexico over 400 years old. The leaves are green, elliptic or oval in shape and 8 to 25 centimeters (3 to 10 inches) long. They are alternately arranged on the tree. Besides for eating, fresh and ripe avocado can be used to soothe sunburns and to improve tonus of the skin. Avocado has greenish-yellow flowers. They are very small and have only 5 to 10 milmeters (0.2 to 0.4) inches in diameter. Flowers are perfect (has both male and female parts). An individual flower will be open for 2 days, however the timing of the male and female phases are distinct. Since both parts are not open at the same time, it is very difficult for an avocado flower to pollinate itself. Avocado is often consumed raw because cooking changes its taste. It is often served in the form of shakes, ice creams and dips. Like other fruits, each avocado emerges from a bloom on the tree. Only pollinated blooms will produce an avocado. The avocado fruit may be pear-shaped, egg-shaped, or spherical, and the skin of the fruit may vary in texture and color. The skin may be pliable to woody, smooth to rough, and green-yellow, reddish-purple, purple, or black in color. The fruit is 7–20 cm (2.8–7.9 in) long, weighs between 100 and 1,000 g (3.5 and 35.3 oz), and has a large central seed, 5–6.4 cm (2.0–2.5 in) long. Avocado is rich source of fats, vitamin C and vitamins of the B group, minerals (especially potassium) and fibers. It is healthy fruit that is recommended to everybody. Unfortunately, some people develop allergies after consumption of avocado. The flesh of the fruit is greenish yellow to bright yellow when ripe and buttery in consistency, but inferior varieties may be fibrous. Like the banana, the avocado is a climacteric fruit, which means that the fruit matures on the tree, but ripens off the tree. Once picked, avocados ripen in one to two weeks (depending on the variety) at room temperature (faster if stored with other fruits such as apples or bananas, because of the influence of ethylene gas). A ripe avocado yields to gentle pressure when held in the palm of the hand and squeezed. Avocado is also known as "alligator pear" because of its pear-like shape and rough texture of the skin. Unlike many fruits that typically have a sweet or acidic taste, avocados have a smooth, buttery consistency and a rich flavor. The avocado is a popular and highly nutritious fruit. It is high in healthy fats and fiber and rich in vitamins and minerals, such as B-vitamins, vitamin K, potassium, copper, vitamin E and vitamin C.
Avocado tree produces oval or egg-shaped fruit that has fleshy structure and large seed in the middle. The health benefits of avocado include weight management, protection from cardiovascular diseases and diabetes, treating osteoarthritis and enhancing the absorption of nutrients for the body. It also reduces the risk of cancer, liver damage and Vitamin K deficiency-related bleeding. Avocado has green or yellow flowers that easily blend with the rest of the tree. They are very small and have only 0.2 to 0.4 inches in diameter. Avocado helps in keeping eyes healthy and protecting the skin from signs of aging and the harmful effects of UV rays. It also helps in maintaining blood sugar levels and has antioxidant properties. It even helps to increase circulation, boost cognitive abilities, and build stronger bones! 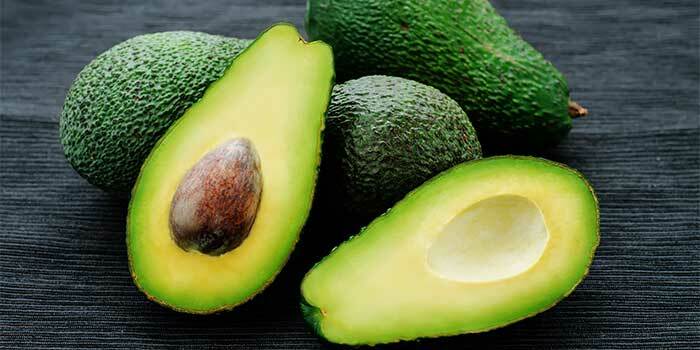 The avocado consists of 73% water, 15% fat, 8.5% carbohydrates (mostly fibers) and 2% protein. Tere are 160 calories in 100 grams (3.5 ounces) of Avocados. Generally, avocado is served raw. It is used in both savory and sweet dishes, though in many countries not for both. The avocado is popular in vegetarian cuisine as a substitute for meats in sandwiches and salads because of its high fat content. Avocado has elliptic, 4 to 10 inches long green leaves. They are alternately arranged on the tree. Avocado slices are frequently added to hamburgers, tortas, hot dogs, and carne asada. Avocado can be combined with eggs (in scrambled eggs, tortillas, or omelettes), and is a key ingredient in California rolls and other makizushi (“maki”, or rolled sushi). In the Philippines, Brazil, Indonesia, Vietnam, and southern India, avocados are frequently used for milkshakes and occasionally added to ice cream and other desserts. Avocado tree can reach 66 feet in height. Oil extracted from avocados can be used for cooking and preparation of salads, sauces and marinades. The major commercial producers of avocados are Mexico, the Dominican Republic, Colombia, Peru and Indonesia. California produces 95% of all avocados grown in the United States. The Hass variety is the most popular type of avocado in the United States. The word “avocado” is derived from the Aztec word “ahuacatl,” meaning testicle; probably because of the likeness between the fruit and the body part. The oldest evidence of avocado use was found in a cave located in Coxcatlán, Puebla, Mexico, that dates to around 10,000 BC. The avocado tree also has a long history of cultivation in Central and South America, likely beginning as early as 5,000 BC. A water jar shaped like an avocado, dating to AD 900, was discovered in the pre-Incan city of Chan Chan. According to the Guinness World Records, the world’s heaviest avocado is an avocado grown by Gabriel Ramirez Nahim, of Venezuela. It weighed 2.19 kilograms, or 4.83 pounds, on Jan. 28, 2009.